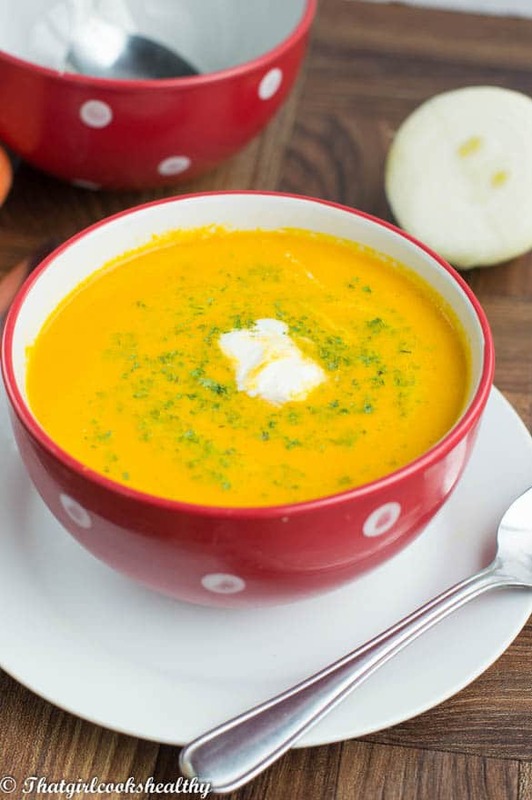 Creamy carrot ginger soup – This winter warming dairy free soup consisting of carrots, a hint of ginger, coconut milk and vegetable stock. 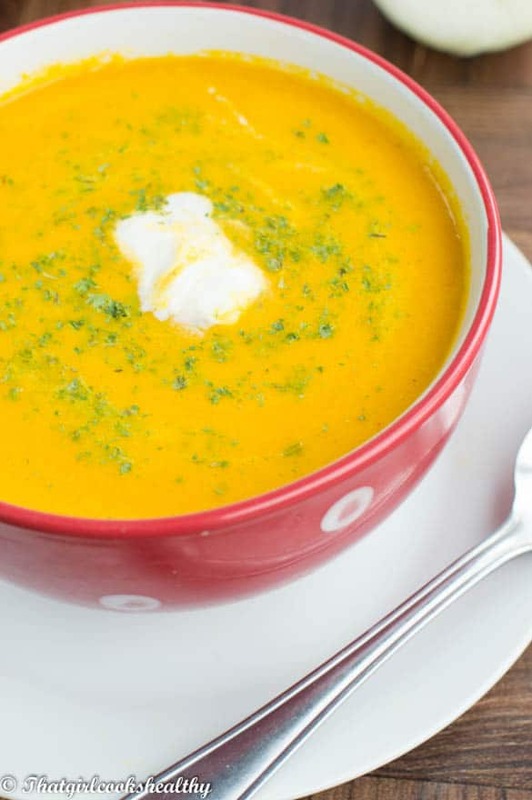 Since we are still in the middle of winter and summer is no where to be seen, I thought it would come in handy to unleash this creamy carrot ginger soup. Soup and winter are virtually synonymous, how would one cope without drinking a bowl of creamy, filling and delicious soup on a cold winters day. 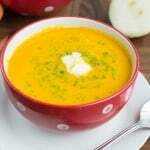 Now carrot ginger soup is like an arsenal against the common cold and flu like symptoms, so drink up! Honestly people your immune system will thank you for stimulating the growth of white blood cells to help combat those nasty antigens. I’ve noticed whenever I eat plenty of anti-inflammatory foods, especially in the winter, I’m less inclined to fall ill (knock wood). 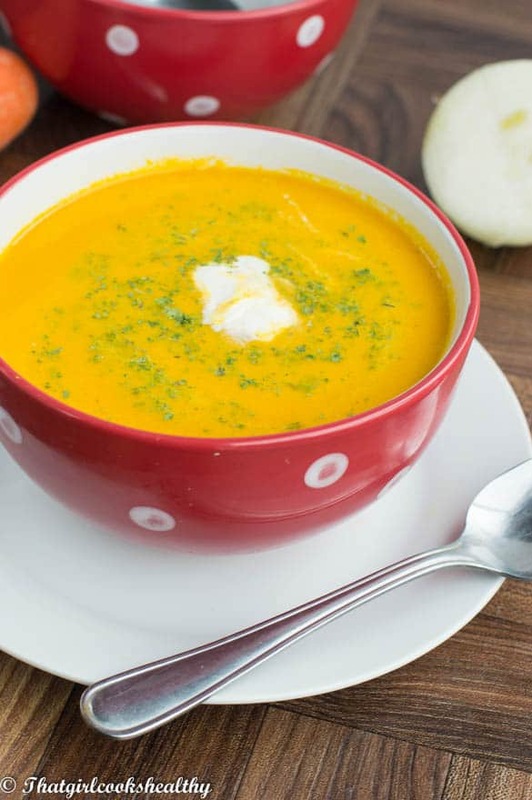 I urge you to consider sampling this anti inflammatory soup recipe, whether you’re recovering from a cold or suffering from an auto immune disease like lupus or psoriasis, then you’ll need this in your life. It’s very simple to make – a dash of curry powder, lends a hint of spice. Everything featured is homemade including the coconut milk and vegetable stock. I do recommend using a blender to liquidise the veggies and if you own a vitamix well there’s the ability to warm the soup at the same time. Can I make the recipe even if I don’t own a vitamix? Yes of course!! Non vitamix owners can simply pour the soup back in the pan to get warm. Begin by sautéing the garlic and onions in the coconut oil on medium heat until slightly golden brown in colour. Next, add the ginger and carrot slices to the same pan with the garlic and onions and cook for a further 1-2 minutes. Pour the vegetable stock into a large saucepan on low-medium heat and add the coconut milk, cayenne pepper, curry powder and black pepper. Reduce the heat to low and allow to simmer for 5-10 minutes, until the carrots are tender. Carefully transfer the watery contents to a blender and liquidise – The soup should still be hot and will retain it’s heat using a vitamix for 1-2 minutes. You can of course pour the liquid into a pot to re-heat or serve later and re-heat at a more convenient time. Charlene, you are killing me with all these great recipes. Sometimes , I want to take a month off blogging and just try out recipes. Maybe someday. Another great recipe. Thank you, this one has been in my arsenal for some time now. I have perfected the recipe to a tee now and know you will like it.